The new Magic Trackpad 2 and BetterTouchTool provide several dozen additional finger gestures for all types Mac and application related tasks. Using the power of Force gestures, you can rely less on keyboard shortcuts, and even save clicking and tapping to trigger actions. 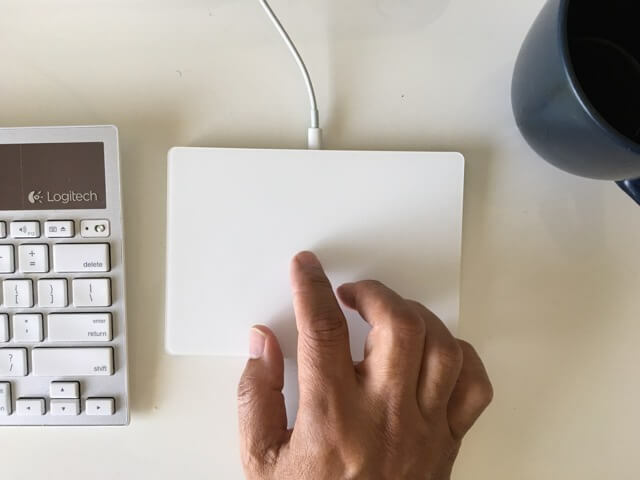 In the last year, my 5+ year-old Magic Trackpad could only hold 15% charge, and that was only when I kept it connected to a Mobee charger. So when the developer of BetterTouchTool released an update featuring a few dozen force touch gestures, I had the perfect excuse to get Apple’s Magic Trackpad 2. For its price tag ($129) the Magic Trackpad 2 is not going feel worthy of the upgrade. Though it’s nearly 30% larger than the old trackpad, less bulky, and thankfully no longer runs on rechargeable batteries, it realistically should be no more than $75, or perhaps less. Price aside, the new trackpad has all the features of the older model, but it also includes what is called Force Touch, which brings additional functionality to the device and the Mac. So in addition to clicking (or tapping, which is the system preference I use on my Mac) items, you can press a little more firmly down on items to trigger particular actions. For example, when you force press with a single finger on a file icon or image icon, you get a Quick Look preview of that file. This is similar to the traditional spacebar trigger to preview a file. However, there is a notable difference between force pressure preview and spacebar preview. The force press trigger will cause the file to pop-up right above the icon, whereas when pressing the Spacebar of a selected file, the preview will appear in the middle of the screen. On large screen iMacs, the latter trigger provides a better preview of the file. This Apple support page provides a list of other force click features that you might find useful, including force clicking on calendar events to see more details, or force clicking on an airline flight number to get more details about that flight. Also note, that the Magic Trackpad 2 can be used with both Bluetooth and the USB cable connection. I use the wired connection on my iMac so I don’t have to deal with Bluetooth issues, which are often more of a problem on older Macs. A few articles I read contend that the Magic Trackpad 2 doesn’t work with Bluetooth on older Macs, but when I turned on the device, it instantly connected with my Bluetooth and seemed to work okay. My favorite and most used force click feature is a single finger press on a link in Safari to get an inline preview of the linked webpage. In the earlier version of this feature, you could tap with three fingers to get the preview. But with the force click, the preview remains open even after you left your finger off the trackpad, which then allows for scrolling through the preview webpage. As the video below shows, the force click also works with links in Mail, which I don’t think could be done with the older trackpad model. While Apple provides several dozen very useful built-in actions for force touch (including triggers for specific applications including Photos, GarageBand, Maps, and Preview), I still prefer the power of BetterTouchTool to create custom finger gesture actions. (See my comparisons of BTT and Apple’s finger gesture features. If you read this blog site on a regular basis, you know I’m a heavy user of BTT and I highly recommend it for increasing your Mac productivity. If you’re not familiar with how to use BTT, here’s my intro article and video. The latest update of BTT includes Force gestures for both the trackpad, which a majority of the responders to my survey indicated that they use. With BTT, you can trigger keyboard shortcuts or trigger over a hundred predefined actions. The additional force click gestures in BTT simply give even more ways to perform actions. As a heavy user of BTT, I have a few dozen global finger gestures that I use, and I could always use a few more. Though I’ve only been using the new trackpad a few days, I have already assigned a few more very useful BTT gestures and actions to my arsenal. The two I’m using most so far are the three, four, and five-finger force click actions. 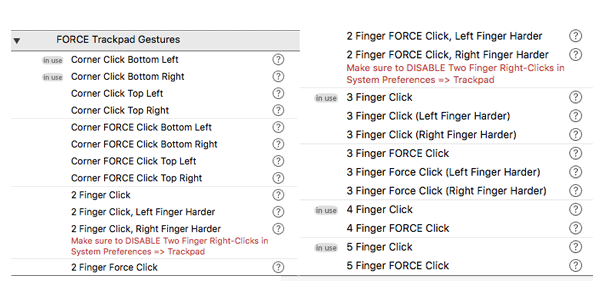 I use an assigned force gesture to quickly activate BTT, another one to activate Keyboard Maestro, and a five force click to bring up a new Finder window. These actions work from within any application, thus reducing the need to launch or activate these applications from the Dock or the application switcher. With BTT, only one click is required to activate one of these applications. I also created a Corner FORCE Click Bottom Left to open a selected image in the screenshot application Snagit. I don’ t use Snagit a daily basis, but the BTT action means I can open a file in Snagit in one click, instead of right-clicking on the file and choosing Snagit from the “Open With” in the contextual menu. I tried first using the 2 Finger Force Click, but unfortunately it wouldn’t work. So instead, I simply use my thumb to click on the bottom left corner of the trackpad. There’s a slight difference between clicking and force clicking with the new trackpad. With force click you click and hold to trigger an action, instead of just clicking. 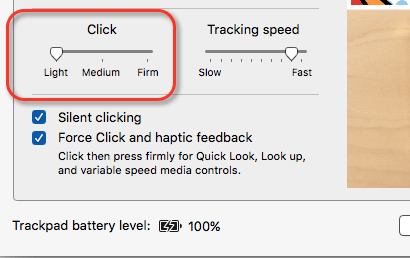 In System Preferences>Trackpad>Point & Click, you can adjust the pressure required for the clicking. I moved it to Light and found that to be a little faster for force clicking. I also find in the Magic Trackpad 2 that clicking itself feels smoother and faster. I realize that BetterTouchTool doesn’t have a suave attractive user interface, but it’s a very powerful but not very difficult application to use, especially if you don’t like using keyboard shortcuts. 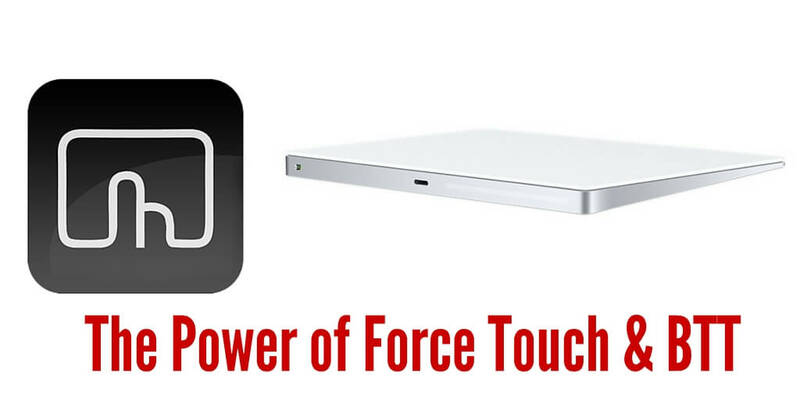 BetterTouchTool can perform nearly any action on your Mac that you do manually. 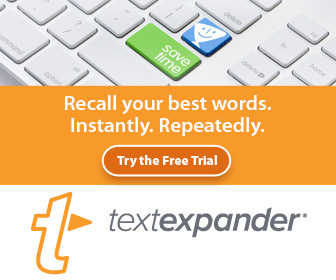 You can get a free trial download of BTT. It gets updated on a regular basis, and I haven’t had a significant problems with it on my Mac. For more about BetterTouchTool, see my articles and tutorials. I tried with System Preferences>Trackpad>Point & Click, to adjust the pressure required for the clicking. I don’t feel any difference between Light, Medium and Firm. I just tried, it seems very subtle. Is there a reason you need to adjust it? I prefer Tap to Click.